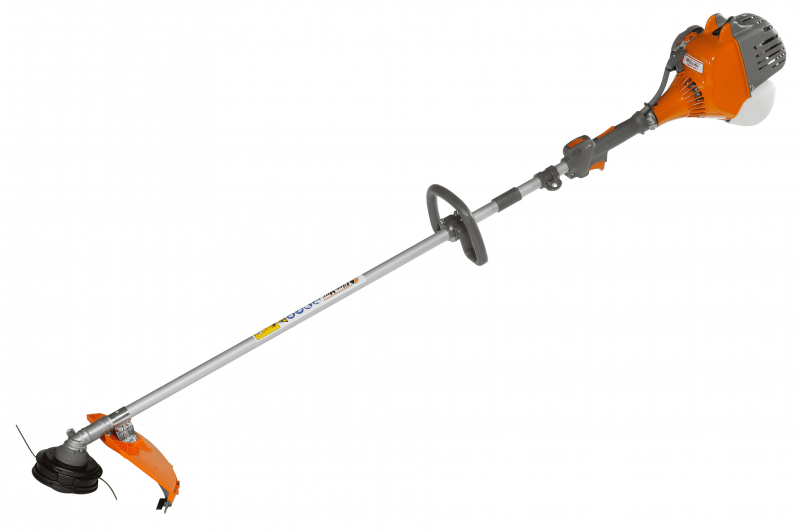 Domestic brush cutter for tidying gardens. This is a light and easy to handle machine that is able to keep vibrations to a minimum as it is well fitted with self-lubricating bushings on the transmission shaft, whilst the engine and grip have been kept separate. Light-weight and easy to handle machine is able to keep vibrations to a minimum as they are fitted with self-lubricating bushings on the transmission shaft, whilst the engine and grip have been kept separate. The forged steel drive shaft and connecting rod guarantee dependable performances and long life. Centrifugal clutch with shoes of sintered material ensuring resistance to stress and long term durability. Equipped with a primer that fills the carburettor with fuel mixture to ensure easy starting with a limited number of pulls. Air filter accessible simply by pressing a release clutch (no tools needed). Available in burn right version complying with euro 2 emission standards.